"With mirth and laughter let old wrinkles come." 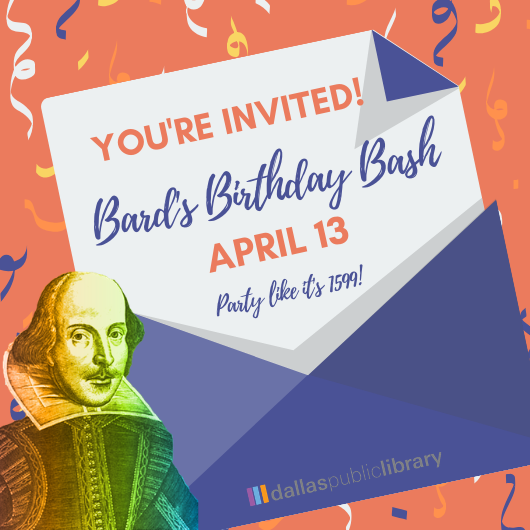 Help the Library celebrate Shakespeare's 455 birthday with fun activities on all 8 floors of the J. Erik Jonsson Central Library. Learn how to play bowls, a historic version of bowling that was popular in Shakespeare's time. From Hamlet to Romeo and Juliet, sword fights were a big part of Shakespeare’s plays. The Victorian Fencing Society will demonstrate sword fighting techniques from the time of Shakespeare. Learn about Renaissance stained glass and create a unique and colorful work of art with tissue paper. We'll bring the supplies, you bring your creativity. All ages are welcome. Join us on the third floor at 3 p.m. as we discuss sci-fi adaptations of Shakespeare's works, Shakespeare-inspired sci-fi works, and everything in between with Dr. Jenny Caneen-Raja, a specialist in Early Modern British Literature at the University of North Texas! Learn acting basics with Bare Bones Shakespeare. Pentameters are fun and you should learn why. The local town eccentric and Shakespeare scholar has bequeathed the lost Shakespeare play he claims to have discovered to whoever can solve the clues he hid in his attic. Puzzle your way through Shakespearean clues to claim the play for yourself. Stop by the 6th floor and learn about personality theory to find out which Shakespearean character you are most like! Create thine own folio with the Dallas History & Archives department! Bring your writing ideas to the seventh floor for a craft and learn about Shakespeare's masterpiece with this family friendly activity. What’s a birthday party without family? Come to the 8th Floor to see some family trees from your favorite Shakespeare plays and the family tree for the birthday bard himself! Bring your Shakespeare knowledge and prove you know the most about the Bard. This program is made possible by the generous support of the Dallas Shakespeare Club and the Friends of the Dallas Public Library.